This is the perfect book to celebrate the 80th anniversary of the movie, The Wizard of Oz. It is about the author of the book that inspired the movie, L. Frank Baum, and his wife Maud. I’m about half-way though this book right now and I’m LOVING it. It is the type of book I would have chosen for my student reading group when I was working at Indiana University. I’m co-hosting a virtual book club discussing this book in March. Click here for more info. Remember when I read and reviewed A Well-Behaved Woman by Therese Anne Fowler, the one about Alva Vanderbilt? Well this book, American Duchess, is about Alva’s daughter, Consuelo! I can’t wait to get started on this one. 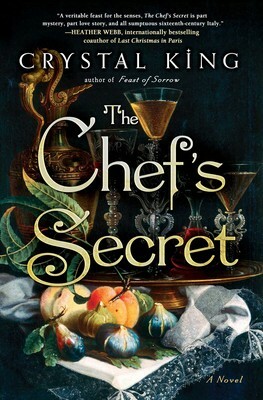 I’ve been hearing GREAT reviews for The Chef’s Secret by Crystal King. My good friends know that I’m a major foodie and all of you know how much I love historical fiction. Put the two together? Gold. Have you seen a more beautiful cover? I absolutely love the pop of color on this one. I have a book feature and author interview coming up at the end of the month on The Secret of Clouds by Alyson Richman.